A New and Accurate Map of all the Known World. 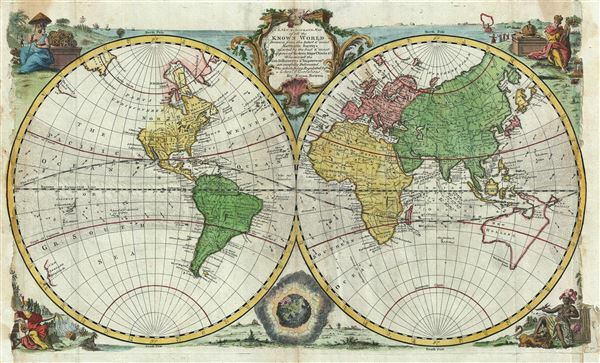 This is an extremely attractive 1747 decorative double hemisphere world map by the English cartographer Emmanuel Bowen. This beautiful map covers the entire world as it was understood in the middle part of the 18th century, before the explorations of Cook, Wilkes, and others. Surrounded by decorative engravings of women representing each of the continents: America in the upper left, Europe in the upper right, Asia in the lower left, and Africa in the lower right. The decorative baroque title cartouche appears at top center. Color coding according to continent. Limited inland detail, but major cities, geographical landmarks, and regions are noted. In the tropics ocean currents are identified – a very unusual addition. This map is most interesting for its treatment of the western coast of America, the Pacific, and most importantly, Australia. Bowen issued this map during a dark period in Australian exploration, the seventy-some years between the navigations of William Dampier in 1699 and Tobias Furneaux in 1773. Consequently most of the cartographic information on this map dates to 17th century Dutch expeditions to Australia's western coast, such as those of Abel Tasman and William Janszoon. We see a very ephemeral speculative mapping of the continent with Van Diemen's Land (Tasmania) and New Guinea attached to the mainland. The unexplored eastern coast of the continent is mapped simply as a straight line running from New Guinea directly south to the tip of Tasmania. New Zealand appears in a very embryonic form as a single landmass with no western shore. This most likely conforms to Abel Tasman's 1642 sighting of the western coast of South Island. Several hundred miles to the northeast of New Zealand a smaller group of islands is labeled 'Land and islands discovered by Quiros. Pedro Fernandez di Quir was a Spanish explorer and religious zealot. Secretive, self-delusional, fanatical, and inept, Quiros made charts that bordered on fictional. It took several hundred years and no less a navigator than James Cook to finally figure out exactly what Quiros actually discovered. Though Siberia exhibits considerable detail consistent with Vitus Bering's 1728 exploration of the region, the opposite side of the Strait, in America, is less clear. Bowen identifies it as 'Parts Undiscovered,' leaving much of the northwestern parts of America blank. What he does do, however, is leave a number of inlets in what is today California that are highly suggestive of possible northwest passages. The mapping of Hokkaido (here identified as Jesso) joined to Sakhalin refers to cartography of Maerten de Vries and Cornelis Jansz Coen, who explored this land in 1643 in search of the gold and silver rich islands mentioned in a Spanish legend. Vries and Coen were the first Europeans to enter these waters, which were in fact little known even to the Japanese. They mapped the Strait of Vries, identified here. They believed this strait to separate Asia from America, which Compagnies Land formed part of, thus elucidating its magnificent proportions. They were also the first European navigators to discover Sakhalin and map its southern coastline. Apparently the Castricum was mired in a heavy fog as it attempted to explore these seas and thus Vries and Coen failed to notice the strait separating Edo (Hokkaido) from Sakhalin, initiating a cartographic error that would persist well into the 18th century. Despite their many successes, the expedition ultimately failed to discover islands of silver and gold, thus proving definitively to Van Diemen that indeed, no such lands ever existed. The sea between Japan and Korea, whose name, either the 'Sea of Korea,' 'East Sea,' or the 'Sea of Japan,' is here identified in favor of Korea (Sea of Korea). Historically, Korea has used the term 'East Sea' since 59 B.C., and many books published before the Japanese annexed Korea make references to the 'East Sea' or 'Sea of Korea.' Over time, neighboring and western countries have identified Korea's East Sea using various different terms. The St. Petersburg Academy of Sciences referred to the East Sea as 'Koreiskoe Mope' or 'Sea of Korea' in their 1745 map of Asia. Other seventeenth and 18th century Russian maps alternate between 'Sea of Korea' and 'Eastern Ocean.' The 18th century Russian and French explorers Adam Johan von Krusenstern and La Perouse called it the 'Sea of Japan,' a term that became popular worldwide. Nonetheless, the last official map published by the Russians name the East Sea the 'Sea of Korea.' The name is currently still a matter of historical and political dispute between the countries. This map was prepared by Emanuel Bowen as plate no. 90 for the 1747 issue of A Complete System of Geography. Good. Some wear and toning along original centerfold. Left and right margins extended with minor print loss repaired in manuscript. Priced accordingly.